Hot air balloons are the oldest successful human flight technology, dating back to the Montgolfier brothers' invention in Annonay, France in 1783. The first manned flight was made on November 21, 1783, in Paris by Pilâtre de Rozier and the Marquis d'Arlandes. Balloons that can be propelled through the air rather than just being carried along by the wind are known as airships. 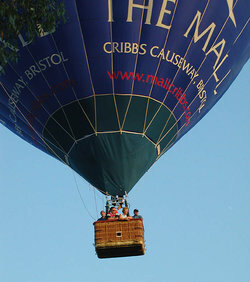 A hot air balloon over Bristol, England, showing the wickerwork passenger basket. This balloon carries advertising for a shopping centre. Attractive aspects of balloon rides include the exceptional calmness and the birds-eye view. Since the balloon moves with the wind, the passengers feel absolutely no wind, unless they rise or descend to a different altitude that has different speed winds than the previous altitude, during the flight. Recent balloons have been made in fantastic shapes, such as hot dogs, rocket ships, and the shapes of commercial products. The first balloons capable of carrying passengers used hot air to obtain buoyancy and were built by the brothers Josef and Etienne Montgolfier in Annonay, France. They were from a family of paper manufacturers who had noticed the ash rising in fires and thought that the smoke was the lifting agent. After experimenting with unmanned balloons and flights with animals, the first manned balloon flight took place on 21 November 1783. King Louis XVI had originally decreed that condemned criminals would be the first pilots, but a young physicist named Pilâtre de Rozier and the Marquis Francois d'Arlandes successfully petitioned for the honor. Hot air balloons were basically paper bags with a smoky fire built on a grill attached to the bottom, so they had a tendency to catch fire and be destroyed on landing. After the invention of the hydrogen balloon, hot air ballooning faded into obscurity until being reborn in the 1960s . The first hot air balloon flight in the United States took place on January 9, 1793. The 45-minute-long flight started in Philadelphia and ended in Gloucester County, New Jersey. The flight was witnessed by George Washington. Balloons were the first manifestation of air power. They were used by the North for artillery observation in the American Civil War and were used for communication during the Siege of Paris in 1871. They were also used for observation of trench warfare in World War I.
Unmanned hot air balloons are mentioned in Chinese history. Chu-ko Kung-ming in the three kingdoms era used airborne lanterns for military signalling. These lanterns, known as Kung-ming lanterns nowadays, are still being flown in China, despite the risk of causing a fire upon landing. A hot air balloon for manned flight uses a single layered, fabric gas bag (lifting envelope), with an opening at the bottom called the throat. Attached to the envelope is a basket, or gondola, for carrying the passengers. Mounted above the basket and centered in the throat is an "air heater" or "burner" which injects a flame into the envelope, heating the air within. Raising the air temperature inside the envelope makes it lighter than the surrounding (ambient) air. This causes the balloon and its cargo to rise. Modern hot air balloons are usually made of synthetic fabrics such as ripstop nylon; a light weight fabric of relatively high strength. During the manufacturing process, the material is cut in long sections known as "gores" and sewn together, along with structural load tapes (webbing) that carry the weight of the gondola or basket. The heater or burner, which very much resembles a flamethrower, is fueled by propane; a liquified gas stored in pressure vessels, quite similar to high pressure fork lift cylinders. The direction of flight depends on the wind, but the altitude of the balloon can be controlled by changing the temperature of the air inside the envelope. The top of the balloon generally has a flap (often referred to as a parachute) of fabric that can be pulled open partially to release hot air in an emergency or for better control of the descent. The flap is pulled open completely to collapse the balloon after landing. In some advanced hot air balloons, side vents are fitted, which when open, cause the balloon to rotate. This is a useful manoeuvre to align the wider side of the basket for landing. The lift of the balloon is determined by the temperature difference between the inside and outside air. On a hot day, the balloon cannot be loaded as much as on a cool day, because the temperature required for launch will exceed the maximum sustainable for nylon. Most hot air balloon launches are made during the cooler hours of the day, at dawn or two/three hours before sunset. This is also to avoid thermals, which are vertical air currents caused by ground heating, which make controlling a balloon more difficult. A hot air balloon is inflated by a bank of propane torches, just before dawn. The largest manufacturer of Hot Air Balloons in the world is Cameron Balloons of Bristol, UK. Aerostar International Inc. of Sioux Falls, South Dakota is North America's largest balloon manufacturer and is a close second in world manufacturing. A typical hot air balloon flight starts with unpacking the balloon from its carrying bag. A gasoline powered fan is used to blow cold (outside) air into the envelope. 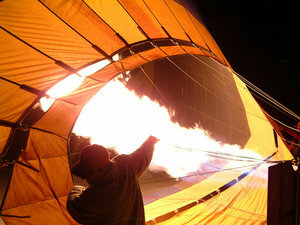 The cold air partially inflates the balloon to establish its basic shape before the burner flame is aimed into the throat heating the air inside (see photo). A crew member stationed opposite the throat, holds a rope tied to the apex (crown) of the envelope. The "crown-man" acts as a dead weight in order to slow the envelope's rise so that the envelope can achieve maximum inflation (volume) before standing erect. Once the balloon is upright, pilot and passengers climb into the basket. When the pilot is ready for launch, more heat is directed into the envelope and the balloon lifts off gradually. Post-launch duties of the ground crew involve packing up inflation equipment and following the balloon with the retrieval transport (also known as a "chase vehicle"). Once the balloon has landed, the envelope is deflated and detached from the basket. The envelope is then packed into its carrying bag. The burner and the basket are separated and all components are packed into the chase vehicle. In competition, the pilots need to be able to read different wind directions at different altitudes. Some experienced pilots are able to take a flight in one direction, rise to a different altitude to catch wind in a returning direction. With experience, luck and the right conditions, some pilots are able to control a precision landing at the destination. On rare occasions, they may be able to return to the launch site at the end of the flight. 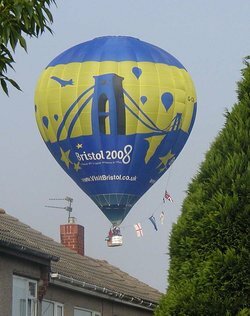 A hot air balloon over Bristol, England, about two minutes from landing. The dangers of the sport include excessive (vertical or horizontal) speed during landing, entangling high voltage power lines and mid-air collisions that may collapse the balloon. In the United States, hot air balloon pilots must have an FAA license. In the United Kingdom a Private Pilots Licence issued by the CAA. On February 27, 1999 while they were trying to circumnavigate the world by balloon, Colin Prescot and Andy Elson set a new endurance record after flying in a "Rozier" combined helium and hot air balloon for 233 hours and 55 minutes. Then on March 21st of that year, Bertrand Piccard and Brian Jones became the first to circumnavigate the Earth also in a Rozier, in a flight lasting 477 hours, 47 minutes. Their records for time and distance remain unbeaten in any kind of balloon. On July 4, 2002, after five previous attempts, Steve Fossett became the first to achieve a round the world solo flight, while also topping his own solo endurance record. 2004 World Hot Air Balloon Championship (http://www.2004worldsballoons.com) - Hosted by Mildura, Australia.